The global life sciences sector is in a period of reinvention. Increased regulation, pricing pressures, and the effects of healthcare reform in many countries have impacted providers’ focus on innovation, value, and improved patient outcomes. Worldwide and market-specific growth is driven by an aging population, rising incidence of chronic diseases, technological advancements and product innovation — and the anticipated impact of healthcare reform in countries around the world. One thing is certain — providers will be looking for ways to manage costs and handle the increased patient volume, while delivering strong patient outcomes. The medical field demands high-speed response, the ability to detect very small signals without false readings, and the utmost accuracy and stability. 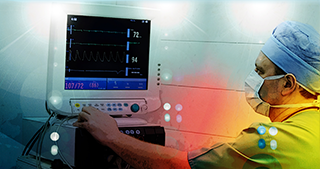 You’ll find our products in a wide variety of measurement applications in healthcare. We provide load cells and specialized force sensors for integrated weighing systems in hospital beds, mobile patient lifters and incubators, force measurement sensors for blood pressure and heart rate monitoring, infusion pumps, and prosthetics, and resistors for medical equipment applications. Original equipment manufacturers depend on us to help with the design and manufacture of quality, reliable, cost-effective medical devices.